PROVOKED: The Enchanted Dairy Fairy Tale LIE! The Enchanted Dairy Fairy Tale LIE! Ah... Just like a fairy tale! The Enchanted Dairy has 1,600 "milking cows" and 1,500 "young stock". Of course they treat each "partner" like a princess and queen! Everyone gets a turn for the ride to the magical slaughterhouse! Oh but life is so very sweet for these pampered cows - just as this young girl tells the tale of their lazy loafing... Doing just what cows want to do all day: eat and "give" milk. Ah! Contented paradise! And for the entranced kids in the audience - There's delightful coloring pages filled with even more of the fantasy at play... So taken by the wholesome spell - even I couldn't help but be drawn into wonderland! Obviously there are no concerns about animal "welfare" at this site... Not a paragraph or sentence to even try to convince us that the cows are so very well cared for. With what they don't show... Isn't it all so evident that they are? Violins up with a swell! Curtains draw closed... The sunsets Happy Ever After at the Enchanted Dairy! Please - If you are under the false notion that cow's milk is "given" by willing bovines ask yourself how and why cows lactate. Ask yourself what happens to the unwanted males. Ask yourself what happens to the mothers once they can't have babies any more... Is stealing milk and stealing lives really that "enchanting"? Please don't buy the myth. 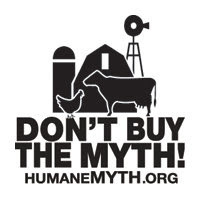 It's amazing how many people do buy into the humane myth. My own mom is one of these people. Just a few weeks ago I told her that cows must be pregnant to begin lactating and she was shocked. At first she didn't believe me. I was like "Did you begin lactating before you were pregnant with me? Did you naturally just start lactating for no reason?" She's still holding on to the belief that dairy is healthy, but I'm working on that one too. She's very resistant. It's just amazing how if it's this hard to educate my own mother about these issues, how hard is it going to be for all of us to educate people we aren't related to? She always pulls the "personal choice" card, to which I reply that animals don't have a personal choice in whether to be tortured and killed, and I deserve a choice in whether I would like my planet to be polluted because of animal agriculture. People don't like to think. It's amazing how a lot of people say "I'm better than animals because I have a smarter brain than they do" -- well f*cking USE it then! THINK!!! Maybe stated even more directly: Grow up...cows "giving" milk...please...and gumdrops grow on trees and money falls from the sky when you wish for it. Much of what passes for "information" is straight out of a rather naive child's fantasy world. No wonder Americans have trouble dealing with reality...they seem to avoid it whenever possible....given how so many of us behave the impulse is understandable but not acceptable. Applause to the blogger and the two Vs ... from me and all the bovines. I'm passing on this advice a very wise man told me about "changing" your family... He said "Forget about trying to change your family. Change the world instead!" Thanks for the visit CQ - I know you can spot the lies a universe away! Sickening is the first word that came to mind for me Bea. The second video in particular was disturbing - using a young child to spread the lies. Propagate the myth. Lying to a child and then getting her to lie!!! And VE - I wish it were actually "a rather naive child's fantasy world". But it's not. It is carefully orchestrated lies and deceit fed to children whose fantasy world should be filled with love and compassion. Hi Harry - I agree the act in the second video was particularly annoying. But that's their way... To show indoctrinated kids so they can convince other kids to follow along the play. All fun and games! But what the kids aren't told is bitterly disturbing. "Me" kids always grow up to be "especially Me adults". I once left a nasty note in a children's book rhapsodizing cows and the milk they "give" us. 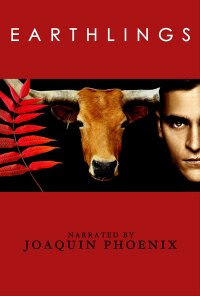 Of course, there was no mention of the poor baby calves and the brutal fate which awaited them; just a sweet story about cows lazying in the meadow all day, eager to be milked dawn and dusk. 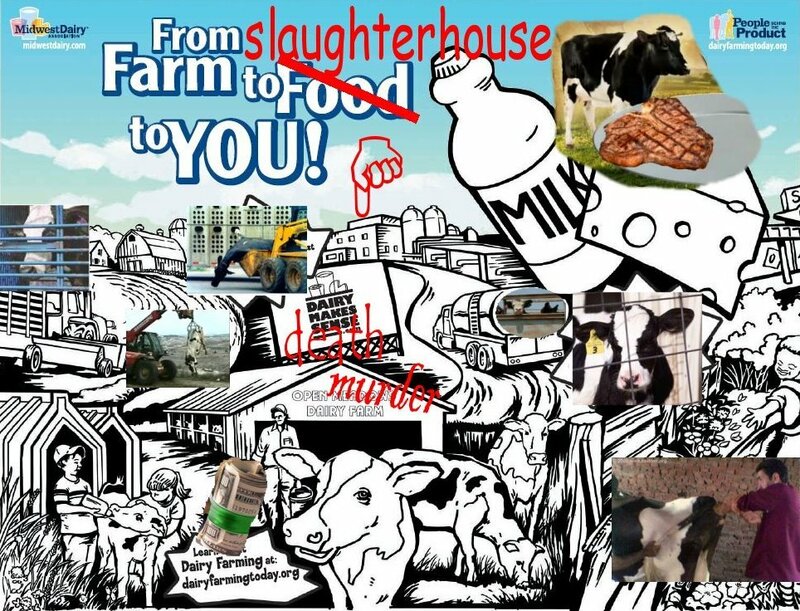 It angered me enough to leave a note questioning what happened to the babies who were the rightful consumers of the milk, not us selfish humans! I like your style Anonymous! What's the saying? When you're fighting evil - Everything's fair.